Joan Leotta has been playing with words on page and stage since childhood. 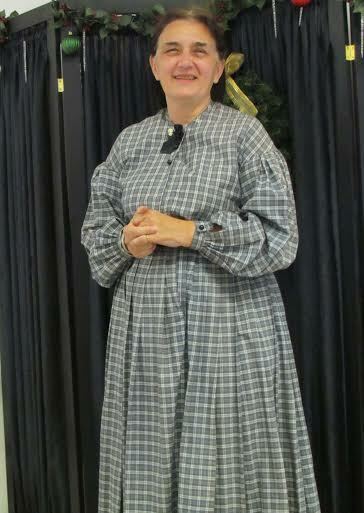 In addition to her work as an award-winning journalist, short story writer, author, poet and essayist, Joan performs folklore and one-woman shows on historic figures, including the Aunt of Civil War spy, Belle Boyd. She can be reached at joanleotta@tmc.net for performance bookings or appearances on writing. The sun seemed so wondrously bright and the sky so blue and when I looked out my bedroom window I saw two robins perched on a tree limb singing out at me. From that wonderful moment ,I knew it would be a glorious day. Why shouldn’t it be? This day was just one day after my very own sixteenth birthday and only a few days before the spring ball when I and several of my friends would be celebrated. With music, festive foods, and dancing , dancing, dancing, as late into the night as Papa would allow! No one scolded as I approached the table, kissed Papa and then sat down at my place, next to Mamma. Papa smiled, but seemed more involved with his morning newspaper than with my attentive greeting. My younger brother Will was standing, leaning against Papa’s chair. Mamma, still seated, was leaning toward Papa and his newspaper, her elbow precariously close to Papa’s morning cup of tea. I coughed delicately into my napkin. “Here? Is the fighting coming here?” Momma’s voice trembled as she queried Papa. Will and Papa, immersed in the excitement of the newspaper headlines were oblivious to the tremulous tenor of her voice. “Not here in the city, but close, yes very close to our own dear capitol of these U-nited States!” Papa replied. “They’ve got nerve, those slavers, they’ve got nerve bringing the fight so close to our capitol, but we will show them!.” He shook his handsome head in disbelief and folded the newspaper and laid it down on the table. ” Those rebs in Virginia and all those other states, why we will face them down and show them who can fight!” blurted Will, eleven years old, and already planning to be a General. “This WAR will soon be over,” interrupted Papa. As he spoke, Papa leaned over and tapped the folded paper with his knife, reached for the butter and then scooped some butteronto his knife and began spreading the creamy fresh butter on his toast. ”Oh how I wish I could be there and see them crush those rebel forces,” sighed Will. Papa looked up at Will and then over to me. My cheeks flushed a deep pink, a deep shade for the cool of the morning. Papa smiled at me again. “The papers say the battle will likely be joined in the early part of tomorrow morning.” said Papa. As my cheeks cooled, I sat down. Jemima brought in breakfast for all of us. Will could hardly eat . “We’re going?” Will’s eyes were bright with anticipation. “How will we get across Virginia to Manassas?” Mother asked. ”How many battles do you think there will be?” asked Will. “I am sure that the battle tomorrow will likely end it all, in one cannonade blast blaze of glory!” Papa replied. I was a bit worried that ending it all would that mean that Lt Harrington would go home to New York. Then I recalled that he was assigned to the guard Congress. Even if the war ended right away, Congress would still need guarding, I was sure. The rest of the day moved by in a slowly boiling wave of heat that reflected not only the season but also the temperament of the crowds on the street. After a short walk I retired to my room and spent the rest of the day selecting what I would wear to the battle and to the Victory Ball that had been hastily planned for the day after the battle. At last I selected a red Garibaldi shirt and becoming skirt—not too many hoops for riding in the wagon. But it was just the right hat to show off my eyes when I look up but a brim wide enough to keep the blast of sun from my face. For celebrating our glorious victory I chose my new gray silk and planned to festoon it with flowers and some of Momma’s best jet jewelry—if she said it was all right. The moon still glistened in the sky as we clambered into the wagon the following morning---well, middle of the night. Papa was driving instead of our man, James. Will wanted to sit up with him, but Mama said if she was going, she wanted a good view so will and I and the picnic basket were in the back. Jemima had filled the large straw hamper with cold chicken, cold beef, fruit and cheese and bread. There was water in bottle and lemonade for Momma, Will and me and beer for Papa. Papa’s hunting rifle was under the driver’s box—lots of rabbits in the country. A nice rabbit stew would make a tasty celebration dinner. I had thought that the sound of old Charlie’s hoofs on the cobblestones and our own soft breathing would be the only sound in the early morning mist. But it was not like that. It seemed that all of our neighbors were heading for that same Potomac River crossing we were going to use to get to Centreville and then Manassas. Manassas, that was the little railroad junction where the newspapers said the war would end, that Lee himself would be humbled by our boys in blue this very day! As the people’s wagons massed for the crossing I heard the sharp call of a bugle. A soldier rode up and told us all to pull to the side so that his troops could pass. “Aren’t our men there already,” asked Papa? We watched them march in fine formation, rifles held hire, brass-buttons gleaming as the waning moonlight checked off each one. The Regimental Flag flew high and proud next to our own dear stars and stripes—it was Lt Harrington’s New York Regiment! I craned my neck . I think I saw him but it was not easy to be sure. All of them looked so proud and strong and the remaining moonlight flashed and gleamed against the sweat on their smiling faces. Despite the early hour it was already warm. Our boys were humming and they waved at us and at the other wagons as they marched off into the early morning mists on their way to glory. We queued up behind the other wagons and by the time we were on the ferry, the mists had began to clear and the sky turned first purple, then deep orange. Summer has us tight in its grip. I did not mind the heat so much—the excitement kept my thoughts cool! Mama had us stop from time to time and she put water on a damp cloth so that we could press it to the back of our necks or to our foreheads to cool us down. Even no, at the end of July the heat is already pressing down upon us. I thought about how hard it would be for our boys to run around carrying guns wearing thick blue wool suits in the heat. I was glad they will not have to do it more than this one day. We had already polished off the last crumbs of our fine picnic basket, though we had plenty of liquid in reserve for the rest of the day and the drive home. We were not strangers to the heat. I felt the red dust on my face kicked up by all the horses and men. Dust from the red dirt roads of Virginia. For a brief moment, I wished that we could stop and spend the rest of the day in the cool shade of the some trees, maybe by a stream. Then I heard the loud boom of the guns, the canon, I expect, pounding our way to glory. The thunder of them shook my very heart and filled papa and Will with pride. acrid smelling smoke was drifting our way from the place where the sounds began. Other smells mingled with the pungent gunpowder aromas—unpleasant ones. I held my handkerchief to my nose. This glorious war does not smell good. It is too noisy by far—a noise that does not seem to let you speak a word to it or with it and certainly not against it. Where is the glory we were promised? Where are the sounds of glorious deliverance? I hear only the cries of wounded men and animals and the relentless laughter of the greedy cannonade and gun lines. But the only flowers here are red spurts of blood upon the ground. A constant low moan of soldiers streams by us, walking faster than our horse can go. Papa sees a young boy fall to the side. His companions try to raise him. We stop and offer t take him back with us. Thank-ee kindly the Midwest farmer sighs and helps us load his friend into our wagon. The boy seems hardly older than 12-year old Will. Will’s face is dirty and streaked with sweat but this boy’s hat is lost and his once-blond hair is matted up with blood and dirt. His face is barely visible behind a mask of grime and sweat and blood. We clip clop along, a floating island of quiet in the blue wool stream of moans and at last we are almost home. Papa stops at the hospital to drop off the boy. He is ever so quiet but his body is still warm as I help push him from the wagon out to Papa and two corporals who are reaching out to take him from us and into the hospital. I hear screams liked those of battle coming from inside the doors of the hospital. Even in the gaslight lamp I can see that the two helpers have bloodstains on the front of their uniforms.